The North American logos and boxarts. Fire Emblem Fates (Japanese: ファイアーエムブレムｉｆ Fire Emblem if) is a turn-based strategy role-playing game for the Nintendo 3DS system. It is the fourteenth installment in the Fire Emblem series and the second for Nintendo 3DS. Character designs and artwork were handled by Yūsuke Kozaki, who was also responsible for the character designs of Awakening, while the basic story was written by the manga storywriter and novelist Shin Kibayashi. Unlike prior games in the series, Fates is split into multiple editions which follow different paths of the same story. Fates is set on a new, unnamed continent split between two great nations which have long been in conflict with each other: Hoshido, a peace-loving eastern nation themed after medieval Japan, and Nohr, a barren, glory-seeking western nation. The story follows a player avatar with deep ties to both nations, born in Hoshido but raised in Nohr, who is at the center of a critical war after a disaster in Hoshido. The player is given a critical choice: to assist Hoshido, their birthright, in repelling the Nohr invasion, to stay with Nohr and serve its cruel king Garon in completing the conquest of Hoshido, or to abandon both and seek revelations about the true origins of the war. When the game was first revealed, it was claimed that it was an entirely original story with no ties to other Fire Emblem worlds, but this is not entirely true as the game features three characters returning from Fire Emblem Awakening. The game is divided into three separate campaigns: Fire Emblem Fates: Birthright (Japanese: ファイアーエムブレムｉｆ白夜王国 Fire Emblem if White Night Kingdom), Fire Emblem Fates: Conquest (Japanese: ファイアーエムブレムｉｆ暗夜王国 Fire Emblem if Dark Night Kingdom), and Fire Emblem Fates: Revelation (Japanese: ファイアーエムブレムｉｆインビジブルキングダム Fire Emblem if Invisible Kingdom). The Birthright campaign has the player side with the Hoshidan army, the Conquest campaign has the player side with the Nohrian army, and the Revelation campaign has the player side with neither and eventually unite members of both nations to their cause. Physical copies of the game are published in two separate editions for Birthright and Conquest, and the side not purchased first by the player is available as paid downloadable content at a lower price than the retail cartridge. Revelation is available only as downloadable content. Digital copies purchased from the Nintendo eShop initially download the first several chapters, then the player chooses one campaign to be downloaded and must pay for the others. In all regions, Fates received Special Edition releases which come with multiple campaigns. The Japanese Special Edition contains both Birthright and Conquest on one cartridge, as well as a download code to get Revelation with no additional charge. The Special Edition released in the rest of the world contains all three campaigns on a single cartridge, allowing players who purchased the Special Edition at launch to experience Revelation before its official release. The story features two opposing kingdoms, the black kingdom of Nohr, and the white kingdom of Hoshido. Corrin is allegedly a blood descendant of the Hoshido family, however, Corrin was kidnapped by Garon and placed into the care of the Nohr royal family. The major choices in the game revolve around who Corrin wishes to align with throughout the story. Corrin dreams of a battlefield where forces from Hoshido clash with the Nohr army, and both sides ask Corrin to fight with them. Corrin is then awoken by Felicia and Flora in the Northern Fortress, where Corrin grew in seclusion with the royal family of Nohr. After a training round with Xander, Corrin is allowed to finally leave the castle and the royal family departs to Windmire to meet with King Garon, their father. The king gives Corrin the sword Ganglari to kill two Hoshidan prisoners, Kaze and Rinkah, as a test of loyalty and ability. Corrin defeats the prisoners but refuses to kill unarmed foes, enraging Garon. The king then decides to send Corrin, their servant Felicia/Jakob (dependent on their gender), their mentor Gunter, and a reformed criminal named Hans on a simple mission to scout a fort near the Bottomless Canyon as a punishment. The fort proves to be occupied by Hoshidan forces, and Hans betrays Corrin and knocks Gunter into the Canyon on Garon's orders. While retreating, Corrin also falls into the Canyon. Lilith then appears and takes Corrin to a pocket dimension, revealing herself to be an Astral Dragon. When sent back to the normal world, Corrin is captured by Rinkah and brought to Hoshido. However, in place of being executed, Corrin is recognized as the lost member of the Hoshidan royal family, kidnapped by Garon during a previous war with Nohr. Corrin struggles to accept the Hoshidan as a family and Queen Mikoto as a mother until meeting Azura, a Nohr princess kidnapped by the Hoshidan in the same manner as Corrin. During the ceremony where the return of Corrin was to be publicly announced, Mikoto is killed by ghastly warriors using Ganglari, revealing that Corrin served as a vessel for the sword to kill Mikoto and take down the barrier keeping Nohr forces out of Hoshido. Enraged and grieving, Corrin transforms into a Feral Dragon, the attackers are killed and Azura manages to make Corrin return to human form. After receiving a dragonstone from Azura to help control the dragon form, Corrin is brought to a battlefield similar to the opening dream, where the royal families of Hoshido and Nohr will fight. At this point, Corrin must make a decision and pick a side. Corrin sides with Hoshido, refusing to serve King Garon, and the Hoshidan royals force their Nohr counterparts to retreat. Soon afterward, Corrin, along with Sakura, helps in the defense of Fort Jinya against Nohr invaders, recruiting an old Nohr friend in the process, and learns about the disappearance of Ryoma and Takumi near Izumo. 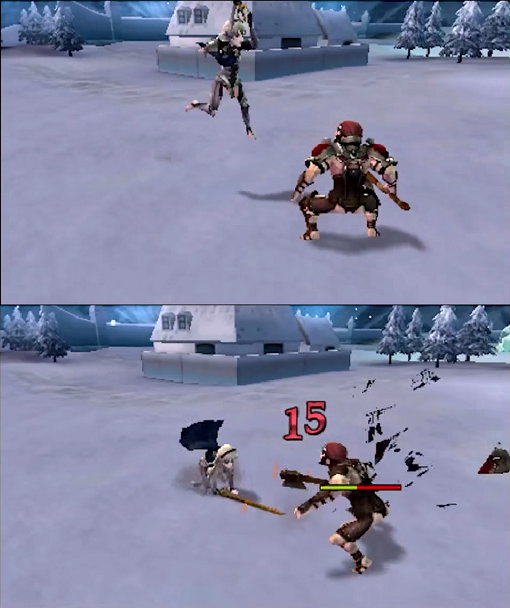 While passing through Wind Tribe territory, Corrin's soldiers and Wind Tribe combatants are tricked into attacking each other by Iago, Garon's advisor. Corrin's army is then forced to fight the Wind Tribe to prove their innocence, but eventually reaches Izumo after recruiting a young Wind Tribe diviner and Hinoka. In Izumo, they are ambushed by Zola, a Nohr mage impersonating Duke Izana. At the end of the fight, Zola is taken as a prisoner and Leo, of the Nohr royal family, briefly appears, letting Corrin notice a change for the worst in his behavior. Heading for the Bottomless Canyon to investigate the site of a recent battle, Corrin's army is attacked by the Mokushu ninjas, who were promised lands if they sided with Nohr against Hoshido. During the battle, a entranced Takumi appears and is brought to his senses by Azura's chants. The prince tells about how he and Ryoma were attacked by overwhelming Nohr forces before falling in the Bottomless Canyon and losing memories of the next events. Corrin's forces also free Kagero, one of Ryoma's retainers, who reports that the crown prince went for Cheve in Nohr after hearing about a civil strife. The party ships a boat to travel to Nohr, but they are attacked by the same warriors that killed Mikoto. Zola gains the trust of Takumi by taking a blow in his place. In Cyrkensia, Corrin meets Kaden and Layla, a singer who must perform for Garon despite her mother dying. Azura sees an opportunity to use Zola's illusions to make her look like Layla while singing, letting the others set an ambush against the Nohr king. However, Garon reveals that he was prepared for the attack and Zola is revealed to be a spy. But the mage asks that Corrin be spared and Garon kills him, his show of cruelty shocking Corrin once again. Overwhelmed, Corrin must retreat and is briefly confronted by Xander until Elise interrupts him. Afterwards, Azura is shown collapsing of exhaustion for a short while, but assures Corrin she is fine. In Cheve, Corrin fights Camilla and her retainers. After defeating Camilla, Corrin pushes through the Nohrian border and is accidentally drawn into a conflict with the wolfskin tribe led by Keaton. Afterwards, a rockslide occurs, potentially resulting in Kaze's death should he have not bonded with Corrin enough. As the group approaches Palace Macarath, Takumi contracts a deadly illness. With the aid of Flora, the group finds medicine to treat him in Macarath and defeats an apparition of Iago, who warns Corrin that there is a traitor in their group. The group then reaches the Ice Tribe village, where Flora is forced to betray the group by Garon in order to protect the villagers. After her defeat, she commits suicide by self-immolation. Corrin next encounters Leo again, and defeats him in battle. However, Corrin refuses to slay the man they once called brother. Azura gives him a crystal that will reveal the true nature of the war to him, and Leo gives them a magic tome that transports them to Notre Sagesse. There, Corrin meets the Rainbow Sage, who blesses the Yato. The Yato resonates with Takumi's Fujin Yumi and transforms into the Noble Yato. Afterwards, the Hoshidans push their way into Windmire. There, they encounter Elise, who agrees to aid them in order to stop the fighting. After subduing Camilla one last time, the group encounters Hans once again. He kills Lilith with an attack meant for Corrin before being slain in battle. The Hoshidans next encounter Iago, who reveals that Takumi's brainwashing was not totally cured and that he has been unwittingly feeding intelligence to the Nohrians and figured out their location each time throughout the entire war. Corrin manages to permanently break him free, and they defeat Iago, who then attempts to beg for his life, but he is executed by Leo for good. Leo gives them his blessing to proceed, but is unable to bring himself to battle his own father. The group then encounters Xander, the last person left guarding Garon, who challenges Corrin to a duel to the death. He initially overwhelms Corrin and prepares to strike them down, but Elise jumps in the way and is fatally wounded. Heartbroken at having accidentally killed his own sister, Xander forces Corrin to kill him. Before passing on forever, Xander tells Corrin to bring peace to the world as he could not and Xander says that Garon is not how he used to be, and Corrin promises to stop him for both of their sakes. Corrin finally reaches the throne room of Castle Krakenburg, and faces down Garon in battle. Ryoma's Raijinto resonates with the Noble Yato, transforming it into the Blazing Yato. While the Hoshidans initially gain the advantage, Garon transforms into a monstrous Blight Dragon and mortally wounds Corrin, destroying the Yato in the process. On the verge of death, Corrin has a vision of Xander, Elise, Flora and Lilith encouraging them to continue. Corrin returns from the brink, with the new restored Yato and Azura sings a forbidden cursed song to weaken Garon. The Hoshidans finally slay Garon, who delivers some strange dying words that lead Corrin to wonder if he may have been dead all along. Afterwards, the power of the song drains all of Azura's life energy, killing her. In the aftermath, Ryoma is crowned King of Hoshido, with Leo and Camilla in attendance. Leo has taken over as the new King of Nohr when Camilla turns it down, not wanting to rule a kingdom. Ryoma vows to arrange a favorable peace treaty with Nohr to prevent another war in the future. Afterwards, Corrin briefly sees an apparition of Azura before reuniting with their beloved siblings. Corrin is unable to betray their Nohrian kin, and together they repel the Hoshidan army. When they return to Castle Krakenburg, Garon and Iago accuse Corrin of being a Hoshidan spy. To test their loyalty, Garon sends them on a suicide mission to the Ice Tribe to quell a rebellion single-handedly. With the aid of Elise, who defies Garon's orders, Corrin successfully stops the rebellion without a single death. Afterwards, Garon sends them to conquer Notre Sagesse. Along the way, Corrin encounters Azura and rescues her from a group of Hoshidans who intend to kill her due to her Nohrian heritage. Realizing she has no more place in Hoshido, she joins Corrin. Corrin also gets into confrontations with Takumi, who is enraged over Corrin's betrayal, and Hinoka, who is bitterly resigned to their choice. During the battle with Takumi, Camilla returns and joins Corrin's forces. The group meets the Rainbow Sage, who advises Corrin to unlock the Seal of Flames to bring peace to the continent. He alters the Yato to become more receptive towards the power of the Divine Weapons. Afterwards, Iago appears and orders Corrin to kill the Sage; they are spared the pain of doing the deed when the Sage dies of natural causes. On the way home to Nohr, Elise becomes severely ill, and Corrin is ambushed by Ryoma while trying to get her medicine. After repelling Ryoma, who still believes Corrin can be swayed back to Hoshido, Corrin is sent to put down another rebellion in Cheve, accompanied by Hans. When they arrive, they discover Hoshidan forces led by Takumi are supporting the rebellion. After defeating the rebels, much to Corrin's horror, Hans massacres rebels and civilians alike. Azura also notes that Takumi is becoming increasingly hostile and that he has changed for the worse since Mikoto's death. The group goes to Cyrkensia to recuperate, and Leo joins them in beating back an assassination attempt against Garon. In the wake of the battle, Leo's Brynhildr powers up Corrin's Yato, transforming it into the Grim Yato. Afterwards, Azura disappears into a lake, and Corrin follows them into a strange, invisible realm. There, Azura explains that Garon has been killed and replaced with a horrific monster, and the two agree to conquer Hoshido, place Garon on the Hoshidan Throne of Truth to reveal his true form, and assassinate him to end the war. Xander joins Corrin's group, and the reunited Nohrian siblings begin the invasion of Hoshido. They battle their way through several regions in the eastern half of the continent, including Mokushu, the Kitsune Hamlet, and the Wind Tribe village. Along the way, Lilith sacrifices herself to protect Corrin from a Faceless attack orchestrated by Iago. The group eventually arrives on the outskirts of Fort Jinya and battles Yukimura, Sakura and their forces. They are defeated and captured, but Garon's men massacre their soldiers. The group next confronts and defeats Takumi at the Great Wall of Suzanoh; at the conclusion of the battle, his body begins to emit a noxious purple aura, and he jumps off the wall to his apparent death. However, the Nohrians are unable to recover his body, and Corrin maintains hope he may have survived. Afterwards, the group reaches Castle Shirasagi and defeats Hinoka, but Corrin defies Garon's orders to execute her and convinces her to go into hiding until the war's conclusion. Finally, the party reaches the throne room entrance, where Ryoma, enraged by Hinoka's apparent murder, challenges Corrin to a duel to the death. Corrin emerges victorious, and Garon orders them to execute Ryoma or be considered a traitor and put to death. Upon learning that Hinoka's death was faked, Ryoma entrusts the future of the world to Corrin and commits seppuku. Afterwards, Garon enters the throne room alone, and Iago and Hans confront Corrin and expose them for faking Hinoka's death and attempts to kill Corrin for treason, but Xander and the Nohrian royals betray Iago and Garon's loyalist, having had enough of their cruelty and without Garon to save them, they challenge them to a duel to take back Nohr from them. They battle, and Corrin's forces defeat and kill Hans and the rest of Garon's loyalists and Leo personally executes Iago once and for all. Corrin then tells them that the war is not over yet, as Garon is the only one yet to be slain and tells them he is no longer human and is controlled by someone or something truly unholy. The group enters the throne room and discovers that Garon has been mutated into a monstrous slime creature, exposing his true form. Garon curses Corrin for tricking him and attacks the Nohrian royals, and Camilla, Leo, and Elise are initially unable to turn their weapons against their father, but Xander remains undaunted and rallies his siblings; his Siegfried empowers the Grim Yato and transforms it into the Shadow Yato. Corrin and their friends battle and destroy the false Garon, putting an end to his reign for good. As they begin to celebrate, Corrin is nearly shot by a completely deranged Takumi. Azura quickly deduces he has fallen victim to the same corruption as Garon did, and all they can do for him is put him out of his misery. Corrin, hoping to sacrifice themself to quell Takumi's rage, allows him to attack them, sending them into a near-death state. There, Corrin meets the spirits of Mikoto, Ryoma and the real Takumi, who explain that Takumi's heart and soul are dead and his corpse has been possessed and turned into a monster who will not stop until Nohr is razed to the ground. Takumi's soul entrusts Corrin with the power of the Fujin Yumi and revives them. Azura uses a forbidden, cursed song to weaken Takumi, and Corrin slays their brother; Takumi expresses his gratitude as he dies. Afterwards, Azura disappears, and Corrin feels as if they will never see her again. They speculate with Xander as to what corrupted Garon and Takumi, but are unable to come to any conclusions. Xander is crowned King of Nohr, with the Hoshidan heir apparent Hinoka in attendance. Xander and Hinoka vow to maintain the newfound peace between Nohr and Hoshido. After the party, Corrin encounters Azura one last time, and she bids them farewell before vanishing. Corrin cannot bear to choose one side over the other, and refuses to pick a side. Both Hoshido and Nohr brand him/her as a traitor, so Corrin runs away with Azura and Felicia/Jakob. Azura leads the way to the Bottomless Canyon, and tells Corrin to follow her and jump. They enter Valla, and discover Gunter, who is still alive. Azura explains that the dragon Anankos wishes to destroy humanity, and that due to a curse, they cannot speak about Valla outside of it; however, they must somehow get the Hoshidans and Nohrians to stop fighting each other and help destroy Anankos. A Vallite mage tells them to leave Valla, advice which Corrin heeds. Corrin attempts to convince people to stop fighting and join him; most are skeptical, but Sakura and Kaze believe Corrin and join him along with Sakura's retainers. While ascending the Eternal Stairway, Iago tricks them into killing Wind Tribe civilians, prompting them to meet their chief Fuga to apologize. After defeating him in battle, Fuga tells Corrin to go to Izumo to learn more about the Seal of Flames. There, Zola is impersonating the Archduke Izana. Zola claims to know nothing about the Seal of Flames, and Gunter calls Zola out on his lies. Zola then reveals himself and freezes the city. After Zola's defeat, he takes Sakura hostage, but Leo kills him for his cowardice. Corrin asks Leo to join him/her, and tells him that Garon is being controlled by someone else, but Leo refuses to listen to a traitor. Leo, however, reveals the path to where Izana was being imprisoned. They also find Takumi and his retainers, who join Corrin after Izana sacrifices himself to speak with the gods. After freeing Kagero from the Mokushujin, they go to Cheve to meet Ryoma. While at sea, Camilla, Flora and a group of Ice Tribe members attack on Garon's orders. After Corrin's army defeats them, Corrin asks Camilla to join him. She agrees, as she would have been executed by Garon for failure if she returned home, while Flora goes into hiding with the Ice Tribe. When they arrive at Cyrkensia, they see that it is in ruins from a battle between Hoshidans and Nohrians. Each group believes the other is destroying the city, but it is actually the Vallites. After a battle against both, Azura calms Ryoma and Xander with her song. Corrin asks them to join him, but they refuse; Corrin then tells them to meet with him at the Bottomless Canyon when the skies change places. Corrin goes to meet the Rainbow Sage. Meanwhile, Xander returns to Nohr to discuss a matter with his father, and Hans and Iago discuss this, the latter believing Xander to have come under Corrin's influence. Elise overhears some of this, and believes that if Camilla is with Corrin, then Corrin must not be a traitor. Xander and Leo go to Garon, who is acting maniacally. Xander believes if they crush Hoshido, Garon will return to his former self, but Leo disagrees. Leo discusses how Garon might actually be controlled by someone else, as Corrin said, but Xander does not believe this. Xander mentions Corrin's request to meet him at the Bottomless Canyon. Corrin and their army arrive at Port Dia. They are attacked by several Nohrians. Elise arrives to meet Corrin there. After beating the Nohrians in a fight, they go to Notre Sagesse to meet the Rainbow Sage. After passing his trial, he unlocks some of the Yato's power, transforming it into the Seal of Flames, the Alpha Yato. He says that it needs all five divine weapons together to become the Fire Emblem. The Rainbow Sage then dies of old age. They go to the Bottomless Canyon, and Ryoma and Hinoka help fight Hans's forces and slain him. They then go to defeat Iago, with the help of Xander and Leo. With the Hoshidian and Nohrian siblings at their side, they all enter Valla. On the way down, Chevois rebel leader Scarlet is killed by a mysterious figure, who claims to be a forgotten god. The others believe that there must have been a traitor. They arrive in Valla, and are guided through by Anthony, a Vallite boy. He appears to attempt to kill them numerous times, and several people agree that he is likely trying to kill them; however, Corrin says he/she believes in Anthony. Anthony leads Corrin alone through the back door of a fortress to prove he is not a traitor, and they are ambushed, Anthony revealing that he is a servant of Anankos. Corrin had planned for this, and the others come and rescue him. Anthony is then transformed into a Faceless by the fortress's magic, and killed by Corrin's army. They fight Arete, Azura's mother and the former queen of Valla, who is the mage from Corrin's first trip to Valla. She is now just a puppet with no memories of her life. After her death, she remembers her life, talks with Azura, and dies. In the castle, Mikoto, Corrin's mother, attempts to trick Corrin into believing she is not a puppet. However, this is a lie which Corrin anticipated. They defeat her, and she regains her memories. She talks with Corrin, telling them she was Arete's sister, and dies. When Corrin is alone, he/she hears the same words from when Scarlet was killed, and is knocked out. He/she awakes to see Gunter, who suspects it may have been the same traitor discussed before. They meet up with Azura. They fight Sumeragi, the father of the Hoshidan royals, who is revealed to be the cloaked swordsman who broke the Hoshidan barrier and killed Mikoto. After his defeat, he talks to Corrin about Mikoto, and then dies. Gunter reveals himself to be the traitor, controlled by Anankos. After Gunter's defeat, Corrin helps him overcome Anankos' control. He explains that Garon massacred his village and family after he refused an offer to directly serve him, causing a deep-seated grudge against the Nohrian royal family that Anankos took advantage of to control him. Anankos appears, and Ryoma's Raijinto, Xander's Siegfried, Takumi's Fujin Yumi, and Leo's Brynhildr all power up Corrin's Alpha Yato, transforming it into the Omega Yato. Corrin and their companions wound Anankos, who summons Garon and eats him to restore his strength. However, Corrin is able to overcome him and finally slay him. Afterwards, Ryoma is crowned King of Hoshido, Xander is crowned King of Nohr, and the two grant some of their land to Corrin, who restores Valla as its new ruler. The three kingdoms finally forge an everlasting peace which Corrin and their families vow to uphold for the rest of their days. It was mentioned in the Nintendo Direct broadcast of January 2015 that the choices the player makes during gameplay will have a "greater than ever" effect on the game's world. It was also revealed that the game will feature challenges "the likes of which have never been seen in the series, up until now". The Pair Up system introduced in Awakening returns, but it and the accompanying dual guard and dual attack mechanics have been changed. Dual attacks now only occur when the units are adjacent, but not paired up, and dual guards only occur between paired up units. The game introduces Japanese-style equivalents to the traditional weapons in the Fire Emblem series: the katana (刀), a form of single-edged sword, the naginata (薙刀), a type of polearm with a weapon triangle advantage over swords, the club (Japanese: 金棒 kanabō), a truncheon-like weapon, the yumi (Japanese: 和弓 Japanese bow), a Japanese bow, and the scroll (Japanese: 呪 spell), fan-like talismans used to cast magic. Daggers return to the series from their previous appearance in Radiant Dawn, and are accompanied by their Hoshidan counterpart, the shuriken (Japanese: 手裏剣 shuriken). The weapon triangle has been altered to encompass all weapons: swords/katanas and tomes/scrolls defeat axes/clubs and bows/yumi, axes/clubs and bows/yumi defeat lances/naginata and daggers/shuriken, and lances/naginata and daggers/shuriken defeat swords/katanas and tomes/scrolls. 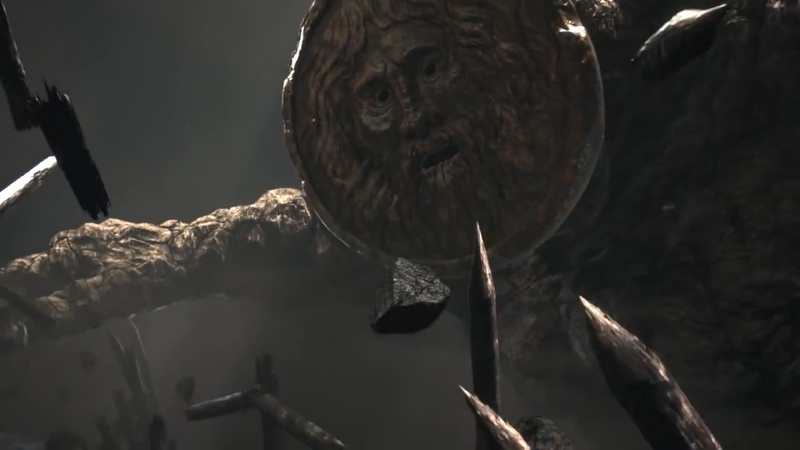 Monsters make a return, with a golem like monster bearing the Mouth of Truth (Stoneborn) as a face appearing in the CGI trailer. There is also another large built monster, defeated by Xander in the trailer, who appears to be wearing some sort of mask (Faceless). In the April direct, this monster was shown to be called "Nosferatu" (ノスフェラトゥ). 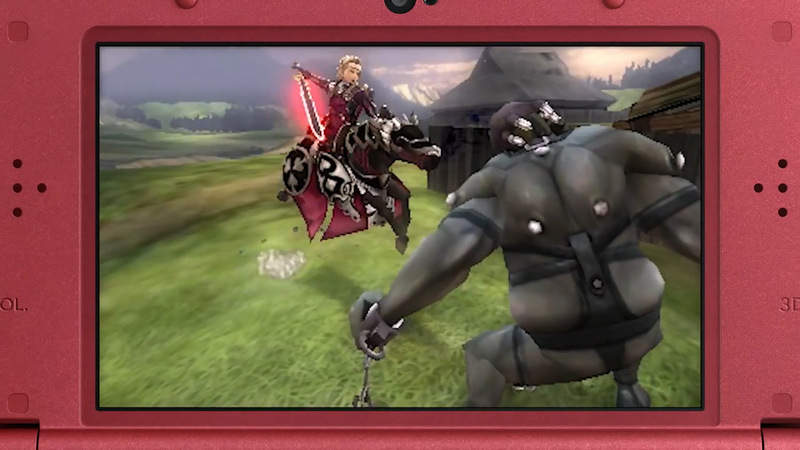 The game also features damage to a unit's armor, in the Nintendo direct, Corrin is seen attacking an axe using enemy, when the enemy takes damage, their pauldrons shatter. The masked monster mentioned earlier also loses its mask when damaged, as demonstrated by Xander. This feature is purely aesthetic, and has no direct effect on gameplay. This was actually present as a feature in Fire Emblem Awakening, but only seen on Grima; his face plate is destroyed past a certain amount of damage. Some terrain bonuses have been altered; for example, water tiles now subtract 10 avoid. Weapon durability has been removed, similarly to Fire Emblem Gaiden. The Classic and Casual Modes introduced in New Mystery of the Emblem return once again. 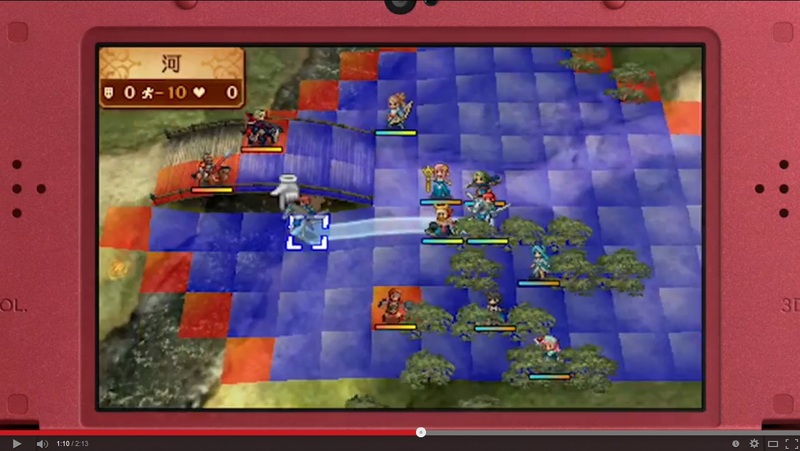 Fates also introduces "Phoenix Mode", wherein fallen units are revived the turn after they are defeated. Unlike other games, non-human weapons such as dragonstones and beaststones now have a weapon rank that can increase from E to A like most other weapons. Between all three campaigns, there is a total of 69 playable units, 21 of whom are second-generation units obtained by pairing the initial cast. 43 of these units are available in Birthright, 41 are available in Conquest, and 68 are available in Revelation. Outside of the initial 69 units, Anna can be obtained in all three routes via DLC. Marth, Ike, Lucina, and Robin may be recruited in all three routes via amiibo connectivity, and Marth, Lucina, and Minerva may be obtained in Japan only, via download codes distributed in special packs of Fire Emblem Cipher cards. Fire Emblem if was first revealed world-wide in a Nintendo Direct broadcast on January 14th, 2015, although in the international broadcasts it was known only as "the latest in the Fire Emblem series". Further information was revealed in a second Nintendo Direct broadcast on 1/2 April, 2015. Information on the My Castle feature was also revealed in a Japan-exclusive Nintendo Direct on May 31st, 2015, although both the individual My Castle video clip and the entire Nintendo Direct have since been set to private and can no longer be viewed. Although the game was confirmed for localization when it was first announced in January, it was announced at E3 2015, where its English name, Fates, was confirmed. Unlike the preceding games, Shadow Dragon and Awakening, Fates was localized in-house by Treehouse at Nintendo of America instead of being outsourced to 8-4. During E3, Nintendo of America featured Fates several times on its Treehouse gameplay stream, demonstrating the game in English albeit at a relatively early stage of the localisation process: debug information was displayed on the bottom screen at various points, the translation of My Castle had not been implemented, and the game apparently crashed during the playing of a cutscene. Nintendo's South Korean subsidiary has confirmed that Fates will be the first Fire Emblem game to be translated into the Korean language and officially published in South Korea. Owing to the long window between Japanese and English release a group calling themselves "Team If" began work on a full text fan-translation of the game. The translation effort was bolstered when international previews and footage revealed the removal of the face petting My Castle minigame from international releases. The initial project was cancelled in March 2016, but the patch received an update by a different team in December 2016 who used the same name. In English Fates has the shortest subtitle in the Fire Emblem series, coming to a single word with five characters in English. In Japanese it ties with Awakening as the shortest subtitle, with both being single word subtitles comprised of two characters; mora-wise, it is the shortest, however, with Awakening's Japanese subtitle being comprised of four morae (かくせい), with Fates only having two (イフ). Japanese 暗夜王国 Kingdom of Anya. Anya (literally, "dark night") is the Japanese name of the kingdom Nohr, which is the focus of this campaign. Korean 암야 왕국 Kingdom of Amya. Amya is a phonetic approximation of Anya, the Japanese name of Nohr. Japanese 白夜王国 Kingdom of Byakuya. Byakuya (literally, "white night") is the Japanese name of the kingdom Hoshido, which is the focus of this campaign. Korean 백야 왕국 Kingdom of Baegya. Baegya is a phonetic approximation of Byakuya, the Japanese name of Hoshido. English Revelation Official English sources occasionally use "Revelations" when referring to the path. This is presumably in error. North American special edition packaging. North American boxart for Conquest. North American boxart for Birthright. Japanese box artwork for Conquest. Japanese box artwork for Birthright. Japanese eShop artwork for the digital version, featuring both games. Artwork from the Japanese official site. Features characters from Nohr (left) and Hoshido (right), with Azura in the center. ↑ The video pages are archived on the Internet Archive (My Castle clip, Nintendo Direct), confirming that they once existed at these URLs.